Our business is built on the quality of skills and expertise possessed by our teams and their ability to maintain them. Monitoring and developing our consultants’ skills is, therefore, a key challenge. Our strategy is to enable our teams to benefit from skills development, which is overseen by our Technical Department: identification of skills, introduction of suitable training programmes, centralisation, capitalisation and sharing of skills. 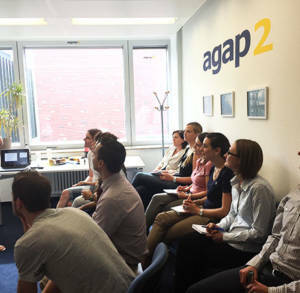 agap2 has developed an internal mutual support network in order to bring together agap2 employees, whatever their profile, with the aim of responding to the various issues they may be faced with. This network enables consultants to share their skills and experience, and helps strengthen team cohesion.